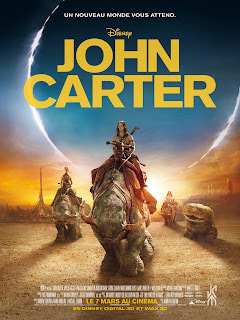 I'd seen John Carter on Tuesday (March 13), but I've been so busy that I was unable to write a review (even though I completely intended to). Then I was added into the Take Me Back to Barsoom! I want a sequel! Facebook group & I decided I should do my bit as a fan of the movie. I haven't read the book or the comics- all my prior knowledge about the John Carter universe came from online news & reviews. The film follows John Carter (Taylor Kitsch), a Civil War veteran, who discovers the secret of a mysterious "cave of gold". He soon finds himself transported to Barsoom (which he later learns is actually Mars), replete with green four-handed giant Tharks led by Tars Tarkas (Willem Dafoe) & the humanoid alien race from Helium ruled by the beautiful Princess Dejah Thoris (Lynn Collins) & her father Tardos Mors (Ciarán Hinds). There's a war waging between Helium & the Zodangans aided by the shapeshifting & technologically-advanced Therns (with Mark Strong's Matai Shang at the fore) & Carter realizes it may just be in his destiny to help end it. The first thing after seeing the film that I felt really glad about is that the two main leads, Kitsch & Collins, FINALLY get their chance to shine in a film that I'm sure will prove to be a great vehicle for them both. Taylor's mature strong voice really hits you when he starts with the narration. He delivers a consistent performance, portraying the (amusing) confusion of Carter on landing in the strange place along with his strength & pathos that truly make you root for the character. It was awesome to see Lynn Collins actually getting something she could really sink her teeth into- Dejah is a strong, intelligent, ballsy woman who knows what she wants & how to get it. Added bonus- she's a killer sword-fighter! 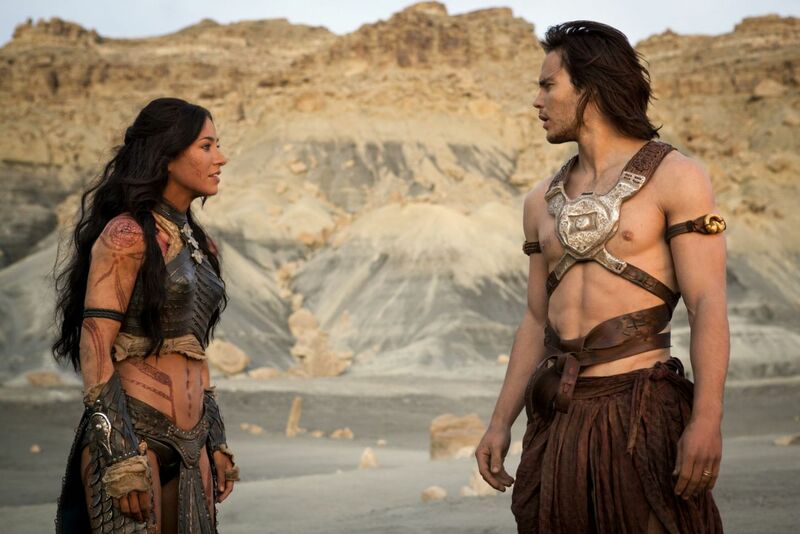 Collins manages to pull off the character of a princess torn in two- what she wants from her life & what her people need from her in order to safeguard their existence on Barsoom. AND Lynn accomplishes this WHILE looking drop dead gorgeous! What can I say about Andrew Stanton? He's a Pixar director (Finding Nemo, WALL-E). Both films won the Oscar for Best Animated Film. Nuff' said. You won't be able to tell that this is his first time directing a live action movie. The Helium palace scenes (below) made me feel that Stanton could have been a good bet to helm Thor 2! 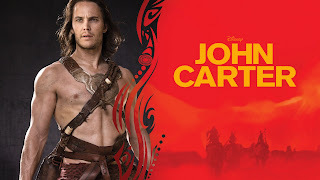 Apparently the character of John Carter in the books was pretty one-dimensional, but Stanton succeeds in making you feel for the character & you hope that he meets with a happy ending. Add to the direction the wonderful editing- especially with that amazing action scene that beautifully intertwines flashback scenes from Carter's tragic past in it. The story is well-written, wasting no time on unnecessary thrills. The movie speaks for itself & doesn't feel the need of simply bombarding the audience with one action scene after the other. This is not to say there isn't enough action- there's plenty of awesome action to go around! All the characters are well chalked out with clear motives & every element serves its own purpose. I like that the film doesn't always take itself too seriously & interjects the heavier scenes with a bit of wit & humor. Now when you have a Pixar director at the helm you'll obviously expect top-notch VFX- AND it definitely delivers on that front as well. The locales of Barsoom & the visually stunning aircrafts are breathtaking to watch. And of course, who can forget about the aliens! ALL of them (below)- the Tharks, the monstrous white apes & the adorable Woola, have been so painstakingly created that it actually aids your belief in the mythos of Barsoom, however outlandish it may be. 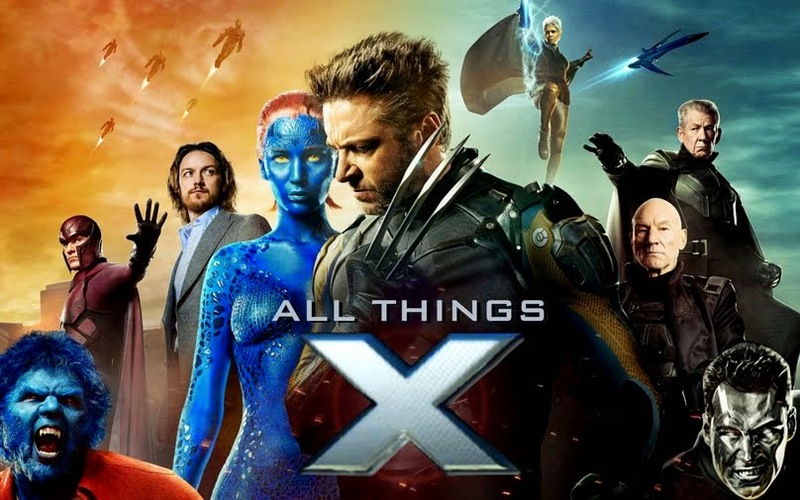 Here I'd like to make an interesting note- all the Thark actors (Dafoe, Samantha Morton & Thomas Haden Church) acted in motion capture suits & walked around on stilts, for appropriate eye contact between the "normal"-height characters & them. So all movement & emotion you saw on the Tharks was very real. This movie definitely is one of those that needs a mention on it's costume design. Their translation of the John Carter Barsoomian costume is bang-on, probably even cooler than the He-Man-like comics one. 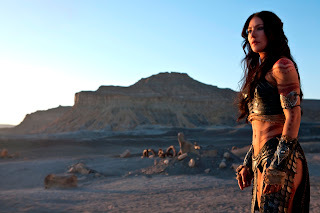 When I saw the trailers for the John Carter movie, I was bummed to not see Lynn Collins in the skimpy costumes that her comics version dons :P, but then the character wouldn't have been taken seriously. I suspect Dejah's remark on the rather revealing outfit she wears towards the end of the movie (below) was a tongue-in-cheek comment aimed at the outrageous comics costumes themselves! Also, smart move of making the Heliumites as simply a tanned & tattooed race- in the books they are actually red-skinned. you give the movie a go. And even if you weren't one (like me), this movie is sure to still leave you thoroughly entertained. UPDATE (30/3): The Back to Barsoom FB group now has a website! Check it out & don't forget to sign the petition! I enjoyed reading your above review. Bravo. Thanks for the review. I hope many more will read and heed...SEE JOHN CARTER! I hope so too! That's the whole purpose of the review...Thanks! I can't believe I still haven't seen this film! Got to get there next weekend. Is Woola as cute as everyone says? Xhibit: The Wolverine Minimalist Movie Poster! X-Event: X-Men Toys at Toy Fair 2012!